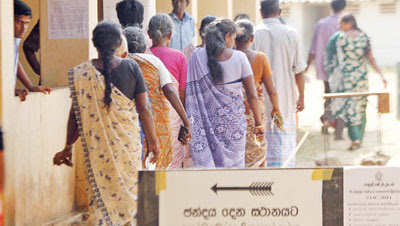 (July 26, Colombo, Sri Lanka Guardian) Defeats suffered by the ruling alliance at the local authority elections in the North would have come as a disappointment to the government, which registered its accustomed victories elsewhere in the country. For the past month a formidable array of government ministers, said to be as many as 40, are reported to have spent much time campaigning in the North. This included President Mahinda Rajapaksa himself. Although the election laws disavow the offering of material inducements during the campaign period, these government leaders did not go empty handed to the North. The government’s media itself took pride in mentioning that goods as diverse as water pumps, sarees and squatting pans had been distributed amongst the people. While there was no doubt that the war affected people of the North could do with this largesse, the election period was not the appropriate time to concentrate such efforts in term of the electoral law that forbids cheating. The government leaders also spoke much about the billions of rupees they had spent on economic development and job creation in the North, as well as elsewhere in the country, and promised more billions would be made available. They opened new buildings, and it is being said even those built by others, and claimed the credit for doing so. The walls of the Northern towns were pasted over with posters of government leaders, which was not in conformity with the electoral laws, but there was no one with the capacity or resolve to take them down. No doubt the fact that some members of the very large military force that is stationed in the North were reported to be putting up these posters would have deterred anyone from taking them down. At the very beginning of the election campaign some of those in military uniforms had shown where they stood when the broke up a meeting of TNA parliamentarians. When election monitors from the South went to the North a few days before the elections, they met with an intimidated and fearful population. Some of them spoke of various irregularities taking place in the pre-election period, but did not wish to put their names to any of the complaints. In this context, there were some of the Northern citizens who spoke in strategic terms about the inadvisability of voting against the government and risking its anger and thereby making a bad situation even worse. There were also those who spoke of voting for the government in order to ensure that the promised economic development and job creation would indeed come their way. The government itself appeared to be banking heavily on its belief that economic development and the prosperity that can flow from it would be the priority concern of the people of the North. However, the election result in the North has proved otherwise. Indeed, the result ought not to have come as a surprise. At nearly all the previous elections in the North, it was the opposition that had obtained the larger share of votes. This included the Presidential and General Elections two years ago, as well as those local government elections held earlier this year. Perhaps it was the scale of the government’s defeat in the North that was surprising. The people of the North, as well as in the local authorities in the East where Tamils were a majority, voted for the Tamil National Alliance by wide margins that ranged from 70 to 80 percent. This contrasted sharply with the government’s victories elsewhere in the country, where the ruling alliance won by majorities that generally exceeded 60 percent. There too the government spoke of the economic development it had brought and the billions of rupees that had been spent and would be spent for the people in the future. In hindsight it would appear that the government’s miscalculation was to speak to the Northern constituency in the same manner it spoke to the Southern one. The promise of economic development and of standing up against the West on issues of national sovereignty did not evoke the same response from the Northern voters as it did with the Southern voters. There is no doubt that the government has succeeded in winning the hearts and minds of the Southern voters who are mostly Sinhalese with its mixture of economic and anti West nationalism. But this did not resonate with the Northern voters who are of Tamil ethnicity. What appears to have resonated with them was the Tamil nationalism articulated by the Tamil National Alliance. For the Tamil voter it would seem to matter more that they have political rights to be free of the massive military presence in their midst and to have their own elected representatives make decisions for them rather than to have Colombo decision makers make those decisions. If the ethnic polarization in the voting pattern between North and South is to end, it is necessary for the government to stop denying the existence of ethnic differences within the polity and instead deal differently with the problem. The manner in which the government focused on the local elections in the North, and invested the time and effort of its leading members, gave an indication of the importance that was given to these elections. A convincing electoral victory in the North would have given a message to the world that the Tamil people of the North, where the war was last fought, were not going to hold the devastation of that war against the government, but were prepared to embrace it and move forward with it. Victory at those elections would also have strengthened the government’s argument that the last phase of the war had indeed been a humanitarian operation to rescue the trapped Tamil people from the clutches of the LTTE. Since winning the war against the LTTE over two years ago, the government has also been steadily backtracking on its earlier promises to strengthen the devolution of power to the North and East. President Rajapaksa’s enigmatic statement during the time of the war that he would offer a political solution that would be "13th Amendment Plus One" has yet to materialize. Instead there are now those within the government to argue against the need for the devolution of power at all and advocate the further centralization of power practiced by the government. A victory at the polls would have made the government’s case stronger that economic development was indeed a preferred substitute for political rights. With its failure in the Northern polls, it is time for the government to think anew on addressing the challenges before it that come from within the Tamil polity and internationally. Hopefully, the TNA would also rise to the occasion and be a part of the solution unlike the LTTE, which had the conviction that it did not need to care about what happened in the rest of the country so long as it had its own way. With the main national opposition party, the UNP, in deep trouble and increasingly feeble in its opposition, it is important that the TNA should add national concerns about good governance and human rights to its agenda of Tamil nationalism. A rejuvenated opposition is needed within the country if constructive pressure is to be put on the government to change its ways.